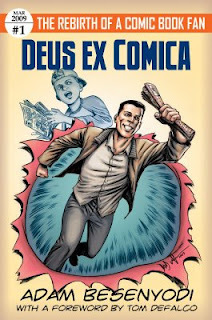 I just read Adam Besenyodi's Deus ex Comica: The Rebirth of a Comic Book Fan. I actually didn't even hear about it until I was about read to publish my own book on fandom, but it looked to be precisely the type of material I wanted to use more of as background. But, by then, it was too late to get a copy of Besenyodi's book, read it, and try to incorporate whatever might be appropriate. But I'm still interested in fandom, and wanted to see what he had to say. I have to admit to a little reluctance in ordering it in the first place. I wasn't at all familiar with Besenyodi, and the book is published through Lulu. No disrespect to anyone printing their book through Lulu -- I'm one of those very folks myself, after all! -- but as there is no vetting process for writers, any book through them could very well be unintelligible. My folks, in fact, were reading another book by one of their friends/acquaintances and both said it was the worst piece of drek they'd ever read. Poor grammar, bad sentence structure, bizarre tangents... they even said the main character changed names part-way through the story! But, to Besenyodi's credit, he's got a good-looking cover and a foreword by Tom DeFalco, so he gave the initial impression at least of approaching the book professionally. But I have to admit to a great deal of relief when I started reading and found that, yes, this guy does indeed have some writing ability. The book is essentially a memoir, centered around Besenyodi's interest in comic books. He started reading them as a Midwestern child in the late 1970s and became a big fan in the 1980s. But he dropped them in high school to focus on important things (like girls) and didn't look back. Until around 2005 when a chance discussion and a bout of nostalgia got Besenyodi back into them. The book is then filled with Besenyodi's thoughts on various comics (old and new), individual issues vs. collected editions, variant covers, conventions, video games and just about every other aspect that's sort of comic book related. I'm honestly pretty ambivalent about the book. On the one hand, it covers largely all the territory I would expect it to. Besenyodi's writing is easily accessible and understandable, and I would like to have used portions of it to provide more anecdotes and quotes for Comic Book Fanthropology. Plus, growing up in Northeast Ohio in the 1970s and '80s myself, there was A LOT of the book that I could very directly relate to. However, he spends an awful lot of time on details that strike me as unnecessary to the point where they're almost distracting. And, more frustrating for me, was that the book was written like a series of blog posts. One of the reasons I didn't write Comic Book Fanthropology sooner was that I had trouble coming up with a cohesive narrative that would run throughout the book. Even though it's non-fiction, I think it's important to have a "plot" to help readers go from one chapter to the next. Ultimately what I did was start with some very broad perspectives on fandom at large initially, and then concentrate my focus more and more as the book went on, each chapter building on the previous one. Besenyodi's book has a tendency to jump around quite a bit; he might be discussing Chris Claremont and Frank Miller's classic stories from the 1980s and suddenly shift to Brian Michael Bendis and Ed Brubaker in the 2000s. Then a couple of chapters in the middle are essentially book reviews covering everything from the old "Giant-Size" Marvel comics of the mid-1970s to Marvel 1602 from 2004. He talks nearly exclusively about Marvel books, so suddenly name-dropping The Umbrella Academy and Breakfast of the Gods seem out of place. The writing isn't bad, by any means, but I found it very jarring at times. I think it really highlights the difference in writing for a blog versus writing a book. Any individual chapter here, taken on its own, is pretty good, but presented here as an allegedly single narrative -- one man's life as a comic book fan -- it doesn't really flow very well. Don't get me wrong; I'm glad I read it. If/when I do some revisions on Comic Book Fanthropology, I'll likely include at least a couple references to it. There're lots of good anecdotes in the book and, for a self-published venture, it's quite respectable. But I couldn't shake the feeling that all of the material was just re-purposed from a series of blog postings.